Back to Research Insights >> What to Look For In Apartment Design? It’s often the minor details that can make the most significant difference. This is particularly relevant when it comes to property. Identifying the right features within a property can significantly improve both its rentability and saleability. From an investment perspective these are the two most important considerations and achieving this is key to creating a property portfolio that will create wealth. The most common misconception of prospective investors is mistaking ‘cheap’ property for good value. Generally, ‘cheap’ property remains cheap whereas properties that may have a premium price but offer the features which I’m about to discuss can significantly improve your potential capital gain. Although desired, sometimes it’s not possible to achieve all the following features within a property however, each one will benefit you in the long term. With no (or little) outdoor space to an apartment, liveability is determined by the size and layout of the apartment. Blue Wealth have stringent size controls which ensure all one-bedroom apartments are at least 50 sqm internally and two-bedroom, two-bathroom apartments are at least 70 sqm internally. This means clients are buying apartments which are larger than the average. Until recently, Melbourne lacked restrictions around apartment sizes and we often found that to deliver ’cheap’ properties to the market for a quick sales campaign, developers would shrink apartment sizes. What this means is that while many are purchasing what we’d consider ‘cheap investor stock’, our clients are benefiting from having above average sized apartments which as a result are more appealing to the emotional, owner occupier purchaser. Bedroom separation is ideal in many cases. For properties which are close to employment nodes such as universities or hospitals, a dumbbell designed apartment can allow for shared tenants. 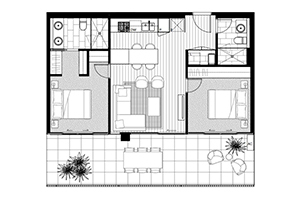 A dumbbell design refers to bedrooms on either side of a central living/dining room. One of the reasons this design is favoured is also because the bathroom separation allows the occupants of each bedroom to have access to their own bathroom. One being an ensuite and the other on the opposite side of the apartment situated proximate to the second bedroom. These designs also provide both bedrooms with an abundance of light and ventilation. These plans are quite rare because their width limits the number of dwellings which can be delivered per floor plate. Our relationship with some of the most reputable developers in the country allows us to influence and, in some cases, dictate the apartment designs. For a tenant, a full kitchen may not be as highly sought after as it would be for an owner occupier but when buying an investment property, it’s critical to consider the end user. Ensuring a property has sufficient bench space and the relevant spaces for appliances is critical. Ideally, an apartment design will ensure the depth of the apartment allows for natural light and ventilation to travel throughout the entire apartment. This is best achieved through wide apartment designs rather than a narrow design. Not only does this improve liveability but it also makes an apartment feel more spacious. From our project assessment perspective an apartment must offer direct access to natural light and ventilation to all bedrooms. This requirement is in place to target the desires of an owner occupier purchaser, maximising your exit strategy and benefitting investors in the long term. This can be affected by the situation of the site and/or if one particular aspect provides a highly sought-after view, for example of the city or water. The desirability of an aspect may also be affected by surrounding buildings, trying to avoid these to achieve maximum light and ventilation into an apartment. Generally speaking, north-eastern aspects are the most sought-after. The benefits and detriments of each aspect can be different in each project. The role of the Blue Wealth research team is twofold with a focus on identifying the market in which will provide the strongest performance while also using the above considerations and our research model to identify the best projects within the approved markets.